Earlier this month, Spike Lee announced the release of the Jordan Son of Mars and another one has surfaced, which is also expected to gain a lot of attention. 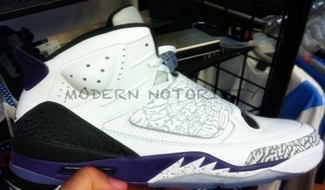 After being released in Black/Red colourway, the Jordan Son of Mars will be released in White/Club Purple colourway, which is as impressive as the other one. White leather comprises the upper part with elephant print on the heel that sits club purple midsole. Watch Out for this one and make sure to buy one!